Sven Bartschi has certainly played his way into the conversation for a top ten pick in the 2011 NHL Entry Draft. Like his fellow teammate, and countryman, Nino Niederreiter, Sven has had an impressive draft year. Despite posting strong numbers in the regular season, and playoffs, the Swiss forward still has many questions surrounding his overall game and final offensive upside. The question remains, is Bartschi worthy of a top ten selection? 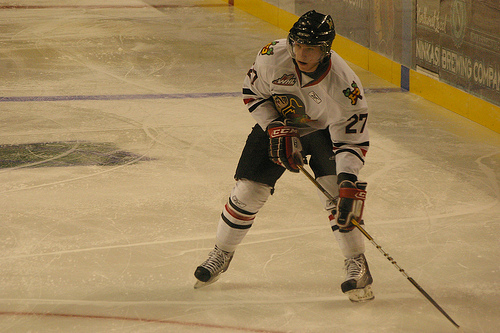 Sven brings a good combination of speed and physical ability to the Portland Winterhawks. Most of his goal scoring chances are created by his speed, or his hard work. His size unfortunately could hinder him along the boards and working behind the net in a more physical league. The biggest issue most scouts are having with him however, is his overall offensive ability. Does he have the ability to be a top line forward? Or will he be a boarder-line top six guy? In his first year playing for Portland, Bartschi posted 34 goals and 51 assists, a total of 85 points… in just 66 games. He also finished with a very impressive plus/minus rating of plus 23. The skill to be a very solid NHL player is there. Nobody doubts that. But he will need to show that he can be a game changer every single night, or teams will go for less safe picks, players that could be elite, or franchise players. Bartschi makes for a very safe pick, because of his specific skill set. He has high top-end speed, and knows how to use his body. Unfortunately, standing at just 5’10” and 185 pounds, Sven’s size may hold him back from being that strong physical presence on the ice. He is not afraid to throw his body around, but until he starts playing with fully developed men in the American Hockey League, or the National Hockey League, it will be hard to tell if his size will be an issue. The Swiss forward would be a great pick for a team like the Colorado Avalanche, who could take a chance with the eleventh pick. The Avs will most likely draft a game changer at the number two pick, and it would be smart for them to take a player like Bartschi right outside the top ten. The type of player that suits a team like the Boston Bruins perfectly, Bartschi would be perfect for a hard working, grinding team. He does all the little things well, and is not afraid to be physical. He will need to learn to use his body a little better before playing against men, but it could turninto a very valuable asset. Bartschi has also looked incredibly impressive so far in the Western Hockey League playoffs. Posting a total of 21 points in 16 games so far, he is a large reason the Winter-hawks will be heading to their first WHL final in ten years. His play has been outstanding including strong performances in big games so far. Rattie is describing a big third period goal he scored the other night, in the finals clinching game for the Winterhawks. While Rattie scored the goal, he appears to be deflecting most of the credit to Bartschi. One last impressive feat for Bartschi is his nomination for the WHL Rookie of the Year. If he takes home the award, teams in the five to ten range might not let him slip past. A team like the Minnesota Wild, who is desperate for scoring help, should be willing to take a chance on Bartschi at ten. Ultimately Bartschi will likely fall just outside the top ten. Despite having all the tools to be a good NHL player, he just may not be able to put it all together and be a top line player. There will always be a place for player like Sven Bartschi in the NHL, but not with a top ten pick.